There is sure to be one Halifax AFL side in the Halifax FA Saturday Cup semi-finals following the draw for the last eight. Ryburn United and Midgley United, who have both won the title in recent years, will meet at Ripponden Wood on Saturday, December 19 (1.45). The only other AFL side through at the moment, fast-emerging Illingworth St Mary’s, face a stern test away to Ealandians. Their hosts from the Yorkshire Amateur League were emphatic 5-0 winners away to AFL leaders Calder ‘76 in the last round. West Yorkshire League sides Brighouse Old Boys and Huddersfield Amateurs have home draws. 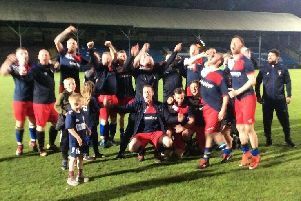 Old Boys will meet the winners of last Saturday’s postponed clash of the two Halifax Irish sides while Amateurs will face one of the sides who fought out last season’s Shay final, holders Ovenden West Riding or Brighouse Town’s development side. Albert Crabtree Cup third round: Brighouse OB v Halifax Irish Club/Halifax Irish Centre, Huddersfield Amateurs v Ovenden WR or Brighouse Town, Ryburn United v Midgley United, Ealandians v Illingworth St Mary’s.